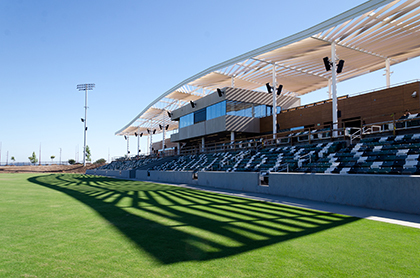 At the Orange County Great Park, all-new amenities for tennis, volleyball, soccer, baseball, softball, and more are now open. The brand new Baseball & Softball Complex opened September 16, and on June 15, an additional 48 acres of amenities at the Great Park Sports Complex opened to the community, featuring basketball courts and more soccer fields. 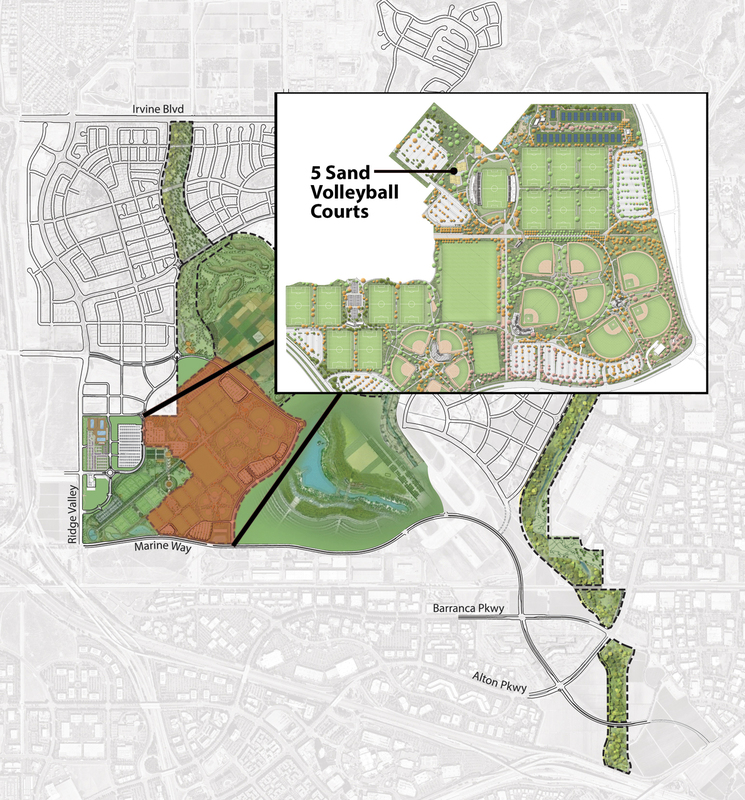 They add to the mix of 53 acres opened in August 2017 as part of the developing Sports Complex that enhances the Great Park's 1,300 acres. 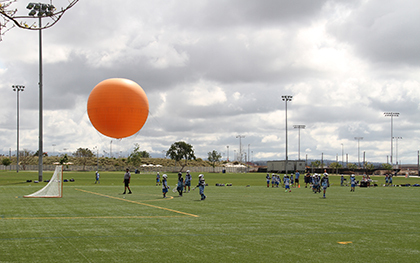 From the whimsical playground to the 25 tennis courts and Championship Soccer Stadium, the Sports Complex is sure to become Orange County’s premier recreation destination. For more information on the newly opened 270,000-square-foot ice facility, visit the Great Park Ice web page. For field reservations, click here. For field conditions, click here. 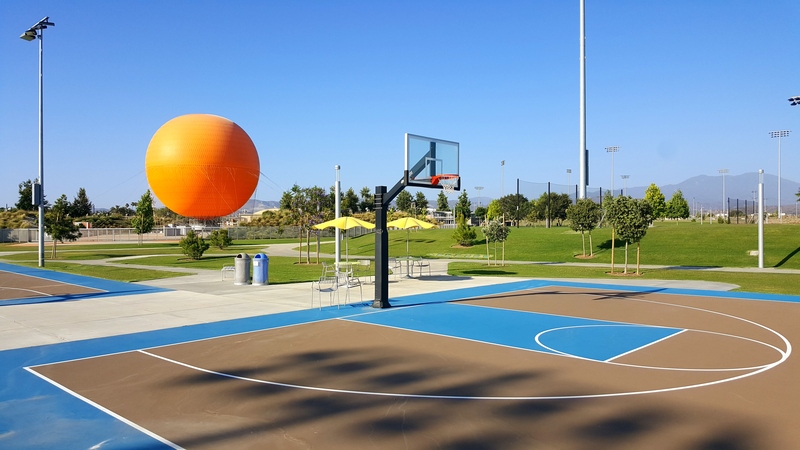 The Orange County Great Park has become a central location for Southern California sports and fitness activities. It is designed to accommodate the local demands of the sports community, while attracting high-level, regional and national sports programs. The Sports Complex Soccer Stadium and fields are drawing players of all ages for youth and adult team practices and games; local, national and international tournaments; and professional teams and club games. Drop-in soccer is available at the North and South Lawn areas daily from 6 a.m. to dusk on a first-come, first-served basis when not reserved for team practices, tournaments or games. Additional lighted fields require reservations. Athletic field hours are Monday-Friday 8 a.m.-11 p.m., and Saturday-Sunday 7 a.m.-11 p.m. View map here. Visit the Great Park Field Reservations page for more information on walk-on field use, or to request a field reservation for tournaments, team practices, games and more. Athletic fields may be closed due to inclement weather; view current field conditions here. For more information, call 949-724-6584 or email facilities@ocgp.org. The Championship Soccer Stadium features seating for 2,500 spectators; locker rooms and training facilities; a box office; concession areas; an upper-level viewing deck; City athletics offices; berm seating areas; and a regulation soccer field. For reservation information, call 949-724-6584 or email facilities@ocgp.org. The Sports Complex includes space for up to 24 soccer fields. Six lighted grass fields, each 120 yards by 75 yards, opened August 2017 and include benches for coaches and players; a spectator viewing area; and 20-foot safety nets behind each goal. A natural grass flex field, which can hold four natural grass full-size soccer fields, and an additional six synthetic turf fields, which can also be used for lacrosse, opened June 15. Drop-in soccer is available on Fields 8-10 and synthetic soccer fields daily from 6 a.m. to dusk on a first-come, first-served basis when not reserved for team practices, tournaments or games. The 30-acre South Lawn highlights two natural and two artificial tournament-quality, lighted fields; spectator viewing area; giant chess sets; extension of the Walkable Historical Timeline; a facility operations building with restrooms; and a one-mile Kaiser Permanente Thrive Path for walkers and runners. At the west end of the South Lawn is a pair of reflecting ponds with a redwood viewing pier that offers visitors an opportunity to stop and take in the view, while serving as part of the park’s water management system. 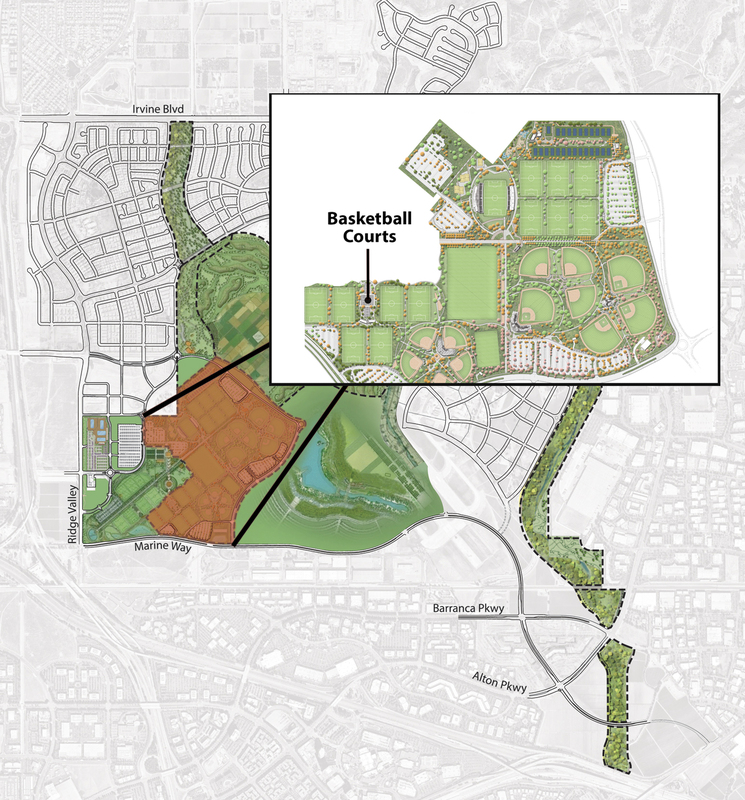 A non-lighted, 7-acre multipurpose recreation area is home to sports and activities of all types. From field reservations to an open recreation space for families to enjoy, the North Lawn offers an opportunity to explore one’s athletic abilities. 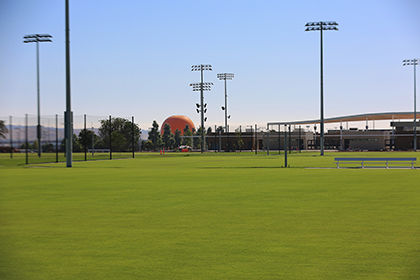 The Sports Complex includes large lawn areas that can accommodate a variety of uses. In addition to the North and South Lawn areas, a natural turf flex field opened June 15, which can accommodate four additional soccer fields. A Tennis Center with a conference room and concession stand, along with 25 tennis courts offer space for: kids camps and lessons; adult team workouts; recreational programs; the Brymer Lewis Tennis Academy; and leagues, match play and championship tournaments. Drop-in courts will also be available daily from 6 a.m. to 10 p.m. For more information, call the Tennis Center at 949-724-6400 or email tennis@cityofirvine.org. The Tennis Center includes a championship court with seating for 132 spectators and an additional 24 lighted tennis courts. 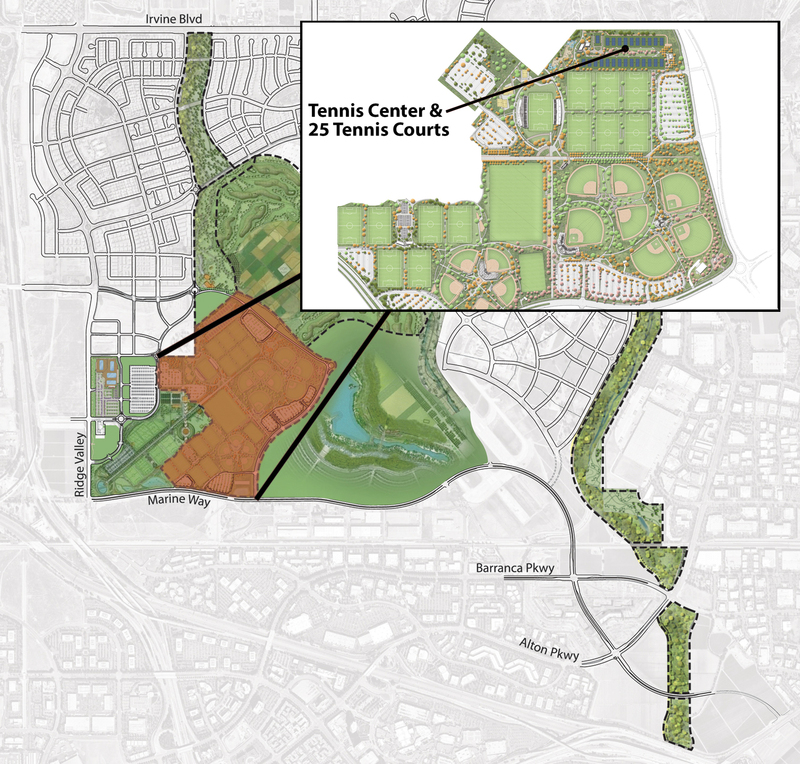 The adjacent Tennis Center includes a conference room, concession area, restrooms and City athletics offices. 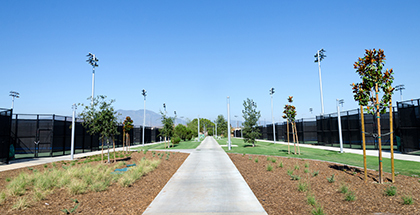 Browse and register for available tennis classes at the Orange County Great Park Sports Complex at yourirvine.org. Monday-Friday: 11 a.m.-1 p.m., 3-5 p.m., 5-7 p.m.
Email info@brymerlewistennis.com to schedule a try-out. The Brymer Lewis Tennis Academy at the Orange County Great Park offers players the ideal training environment for those who are willing to work hard to achieve rapid progress toward their tennis goals. Program coaches Chris Lewis and Chuck Brymer have produced United States Tennis Association (USTA) nationally ranked No. 1 players in every division, highly ranked professional tennis players, and champions of prestigious state and national tournaments including the Southern California Sectionals Triple Crown, USTA National Championship and Grand Slam Junior Championships. 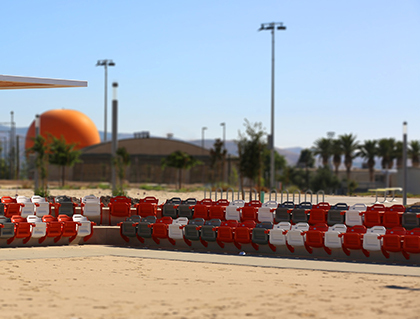 Sand volleyball courts are now open at the Great Park Sports Complex, and are accessible through City programs and drop-in use daily from 8 a.m. to 10 p.m. Volleyballs are available for check out at the Great Park Visitors Center. Call 949-724-6400 or email volleyball@cityofirvine.org for more information. Sand volleyball lessons are now offered for children ages 9-14. Classes include instruction on technique, drills and plenty of game play. Adults 18 and older can also join a league to enjoy some under-the-lights competition on the courts. Volleyball courts at the Sports Complex include a championship court with seating for 178 spectators surrounding a sand court, and four additional lighted sand courts. The Great Park Sports Complex features four basketball courts, opened June 15. The courts are available daily for drop-in use. The brand new Baseball & Softball Complex, opened in September 2018, includes 10 ball fields surrounding two championship stadiums. The fields are accessible via City programs and public reservations. For more information, call 949-724-6247 or email facilities@ocgp.org. 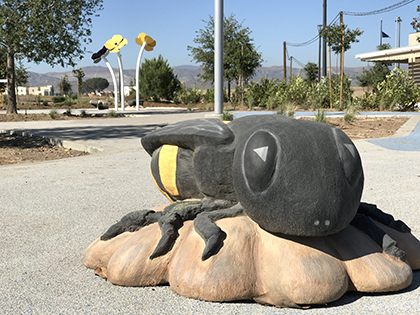 Families visiting the Sports Complex for tournaments or just enjoying the Great Park are discovering amenities including the Kaiser Permanente Thrive Path and the new Children's Play Area, an interactive space with plenty of room to run, jump and explore for kids of all ages. 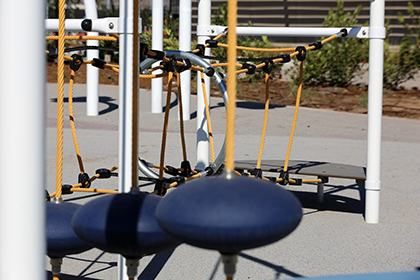 The Children's Play Area features slides, swings, jungle gyms, ropes, climbing areas and more – all within walking distance of the Sport Complex's volleyball courts, Tennis Center, soccer fields and Championship Soccer Stadium. 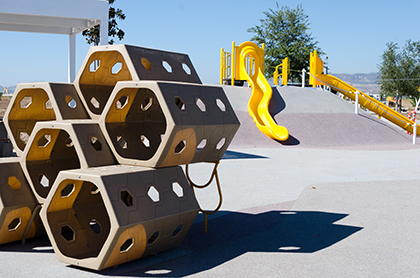 The Children's Play Area is open during regular Great Park operating hours. The Kaiser Permanente Thrive Path encourages visitors to exercise and explore the South Lawn and North Lawn areas. Signage along the path educates visitors about health, nutrition and fitness. It is a great way for parents to stay active while their children attend sports practices, and many utilize it as their daily run path. 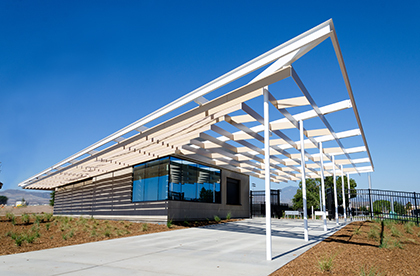 The Kaiser Permanente Thrive Path is open during regular Great Park operating hours. Future phases of the Great Park Sports Complex will bring Great Park trails that are 1-mile long from Irvine Boulevard to the Championship Soccer Stadium. 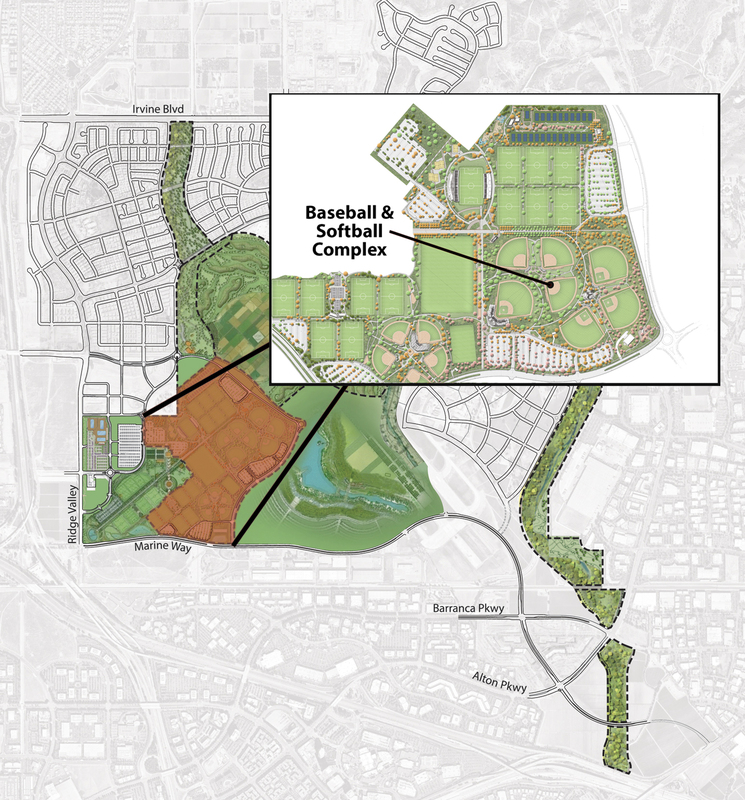 At completion, the Sports Park will cover 194 acres at the heart of the Orange County Great Park.